Ras el Hanout is a North African dry rub, with dried peppers, cardamom, nutmeg, allspice, cinnamon, cloves, fennel, and my favourite of all, rose petals and lavender. I love the idea of eating flowers, so byronesque, beyond romantic. You can get it in North African shops and, increasingly, supermarkets, which where I got mine. A. was doing his first triathalon, so we wanted something lean but tasty for dinner on Saturday to get him prepped. It was a short version of sprint distance (400m swim, 20k bike and 5k run), so he didn’t feel he needed an absolute mass of food or any carbo-loading. The colourful veg provided nutrients, and along with tofu and brown rice were a perfectly balanced meal. 1 You need to press your tofu to get rid of some of the water. Drain the stuff in the packet away and give the block a careful squeeze over the sink. I then placed it on a plate with another plate on top – plonked on the heaviest thing I could find (the pestle and mortar) and left it for 15 minutes. Drain the water from the bottom plate into the sink. 2 Cut the block into even slices. The thickness of a Mills&Boon, about 1.5-2cm. Drizzle with olive oil and pour a little of the ras el hanout on each side of each slice. Rub with your fingers to really get the spices into the nooks of the tofu. You want a nice, even coverage on the outside of each slice. 2 Leave to marinate for as long as you’ve got til dinner. 4Heat a little oil in a griddle or frying pan and fry off the steaks. They’ll need about 4 minutes on each side to get a nice consistency on the outside – chewy but yielding. Serve with roast or steamed veg and a grain for dinner, or cook smaller pieces for party nibbles. This meal looks delicious!! I love the way you prepared the tofu. Thank you. We’re on a mission to make the whole world love tofu – or at the very least to overcome irrational prejudice and at least try it! Thanks! I have had this ras el hanout I bought in a wonderful spice shop in north Carolina and she said its great for lamb, but I said we don’t eat meat! Oh well I’ll figure out a use! Then here we are a year later and I thought tofu but was afraid to use it and end up horrible! But this recipe I can do its easy and boy will m be surprised when I make this! We usually only use braggs or tamari w our tofu. This variation will add a little spice! Thanks! Brill – v happy to help you find a use for it! 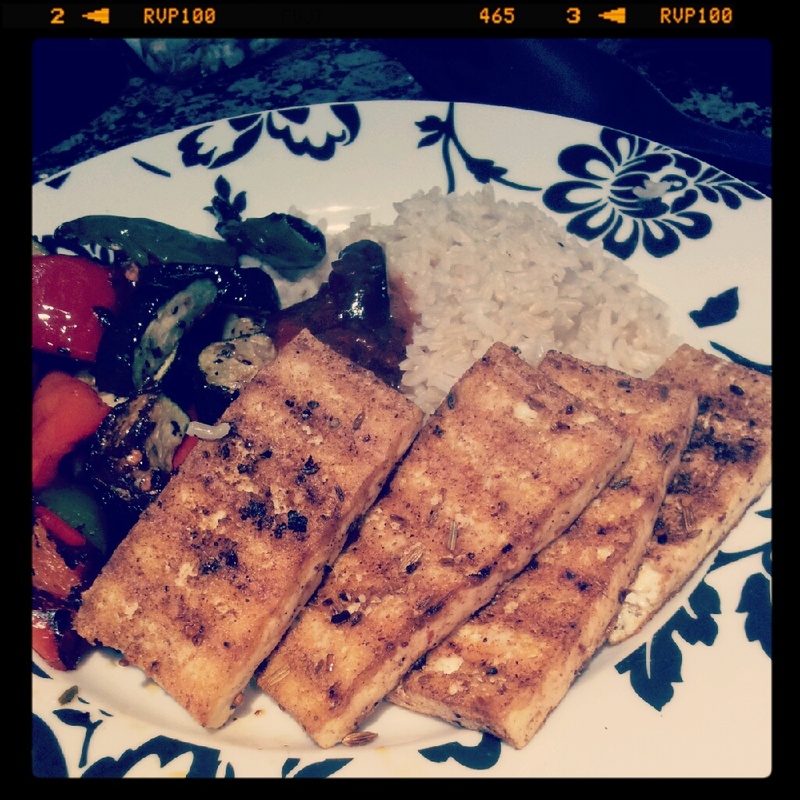 If you’re looking for new things to do with tofu, check out our Sesame Baked Tofu recipe too – it’s yum.